We mentioned on Tuesday that rising senior and five-star shooting guard Antonio Blakeney had backed out of his verbal commitment to Louisville, citing a “quick decision” as his reason for second thoughts, but also leaving the door open for a possible recommitment down the line. Now it seems that Rick Pitino’s program, bemused and bewildered by the young man’s waffling, has decided to take its ball and go home. According to the Courier-Journal‘s Steve Jones, Louisville has no plans to continue recruiting the bouncy Florida shooting guard, preferring instead to focus its resources on adding one more elite piece to its highly-rated 2015 recruiting class. For a composite listing of how the Class of 2015 is shaping up at this early point, take a look at this table of the ESPN, Rivals, Scout and 247 ratings as collated by SBNation. Another former Louisville recruit, Oregon’s JaQuan Lyle, was not on Oregon’s updated roster that was released on Tuesday night, and as Rivals.com reported yesterday, he has not been admitted to the university. The issue appears to be related to his completion of a summer course that would make him eligible, but Lyle, for one, doesn’t appear to be too concerned by it. Even if Lyle makes it into school and onto the Ducks’ lineup, this is going to be an interesting transition year for Dana Altman’s program, with four of last season’s five starters either graduated or booted from the team. Michigan‘s Fab Five basketball legacy, even 20 years later, remains a complicated one. Issues of class and race and media coverage and privacy and amateurism and professionalism and a whole slew of other interrelated variables have followed these guys along ever since they collective hit the national consciousness way back in 1991. One thing, however, that isn’t that complicated, was that notorious Wolverines’ booster Ed Martin paid the likes of Chris Webber and several others to matriculate and play for the blue and maize. There’s really no disputing it (Webber himself copped a plea for lying to a grand jury on that very issue in July 2003). Yet Webber has spent the better part of the last decade-plus holding a grudge against his alma mater for what he felt was unfair treatment — some of it arguably meritorious, some not — and refusing to come to terms with the notion that, setting aside all the other indignities, he still is responsible for some of the darkest days in program history along with the sunniest ones. HoopsHype recently interviewed former Fab Fiver and current NBA analyst Jalen Rose, who called out Webber for his simple failure to say “I’m sorry” to the fans of the program who were ultimately let down by those actions. We’ve said it in this space and on social media many times before, but it remains spectacularly impressive that the most thoughtful and mature member of the Fab Five turned out to be Rose — he remains completely on point. Once upon a time here at RTC, we wrote a silly but fun post evaluating the worst college basketball floor designs in America. It is still today the post that received the most traffic in the history of this site. ESPN.com’s Dana O’Neil might be feeling similarly today after her recent post ranking the top 10 mascots in college basketball went viral all over the interwebs. Of course, the fun in these lists is that they’re eminently arguable, especially through social media, but we were pleased to see the likes of the Stanford Tree and the St. Joe’s flapping hawk on the list. We’re not sure how you leave out a walking banana slug, such as what is found at UC Santa Cruz, or a scare-the-bejeezus-out-of-you-with-a-stare friar, such as what they have at Providence. And then there is this. Madness is in 30 days. 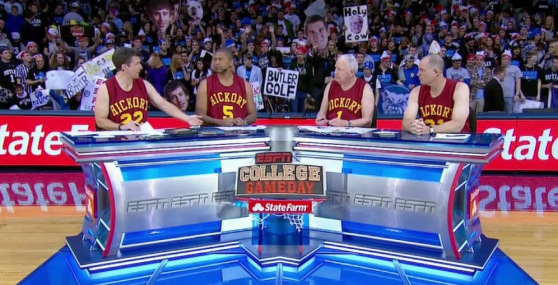 College Gameday Lineup Sizzles, But Can Show Stand To Improve? em>Bennet Hayes is an RTC columnist. He can be reached @HoopsTraveler. During these trying summer months away from the hardwood, a favorite pastime of college basketball fans is putting together the jigsaw puzzle that is the schedule for the season ahead. We still don’t have all the pieces in hand here in mid-August, but over the past few weeks we have heard announcements regarding in-season tournaments, multi-conference challenges, and select non-conference match-ups. The next shoe to drop in the schedule release process came Wednesday, when ESPN unveiled its 2013-14 College Gameday schedule. This new delivery of hoops action to come is a mouth-watering series of match-ups with a pretty comprehensive geographic blueprint (games in seven different conferences are included, plus a Gonzaga vs. Memphis non-conference tilt), and in all likelihood, even more complete coverage of the top of the preseason polls. There is a distinct possibility that every single team in this season’s preseason Top 10 will make an appearance on Gameday. Excited for Saturday nights in 2014 yet? It’ll be hard for that slate to disappoint, but if you will allow for a little nit-picking, we have a few good ideas on how to make Gameday – already a great thing – even greater. With the original and (still) most popular version of College Gameday coming to you from college football’s most famed venues each fall Saturday, there are a few things we wish the hoops variety would steal from their gridiron counterparts. For one, what’s the rush with scheduling? My Wednesday afternoon may have been a little less exciting yesterday, but why not wait until a couple weeks out (like the football guys do) to set the games? That way we avoid providing disappointing teams a national stage (for example, Southern Illinois entered its January 2008 Gameday spot against Creighton with a losing record), and also potentially allow fans to enjoy games featuring surprise teams that may not have been on the preseason radar. Plus, if nothing better materializes, these brilliant original match-ups can stand. Michigan will still be visiting Sparty on January 25, Duke and UNC will still be facing off at Cameron on March 8, and life cannot be any worse! For college basketball fans over a certain age watching the Summer Olympics, an oft-repeated nickname uttered by the likes of Bob Costas, Mary Carillo, Ryan Seacrest and others probably grates a little more than it should. The gold medal-winning US women’s gymastics team, as we all now know, has been labeled by someone lacking any institutional sports memory with the nickname “The Fab Five.” The five girls aged between 15 and 18 didn’t memorialize themselves with the name, but others — most notably former Fab Five mouthpiece and current ESPN commentator Jalen Rose — may stand to make bank from the trademarked name as the team rides its 15 minutes of fame on a barnstorming tour throughout the US this fall. As we saw mentioned on Twitter last week, the Olympics are fundamentally sports for people who don’t typically like sports, and there is no better example of the two groups weirdly crossing paths than this one. If anyone’s wondering, nobody will be talking about this ‘new’ F5 two decades from now — we think the iconic maize and blue legacies of Webber, Howard, Rose, Jackson and King are still safe. It’s taken much of a couple of decades for Michigan basketball to get back to an elite status, as the Wolverines will be a preseason Top 10 team next season. Another local school, Oakland University, has as a matter of fact been to just as many NCAA Tournaments under head coach Greg Kampe in the last decade as Michigan. On Tuesday, Kampe started the first day of a fast where the longtime Golden Grizzlies coach will imbibe nothing but juice for an entire month in support of Coaches vs. Cancer. Um, we just drank a glass of orange juice over here, but, wow. Seriously, though, this is a herculean task for someone no doubt accustomed to eating solid, and undoubtedly, good food — Kampe tweeted last night that his first day of fasting was complete and that “even a yogurt commercial” makes him hungry. To donate to Kampe’s fast in support of CvC, make sure to hit this site. We always make sure to donate around the time of the Jimmy V Classic, but the CvC is getting a double dip from us this year. Team USA’s men’s basketball team will play Australia this afternoon in the quarterfinals of the Olympic tournament, which will allow one of the two college basketball players in the event to take a shot at a team he no doubt idolizes. As Jeff Goodman wrote yesterday, St. Mary’s guard Matthew Dellavedova is looking forward to the challenge of matching up against NBA All-Stars Deron Williams, Russell Westbrook and Chris Paul. The rising senior and current WCC Player of the Year is one of the two SMC starters in the Aussie backcourt (playing off the ball with Patty Mills), and his 8.2 PPG and 4.6 APG have helped his country reach the medal round. For a complete look at his Olympic statistics, check out the FIBA page on the shaggy-haired star. The only other collegian in the basketball Games, College of Charleston’s Andrew Lawrence, played roughly 18 minutes per game for host Great Britain, but he was only able to convert 4-19 field goals and committed nearly as many fouls (15) as he scored points (16). His Olympic experience — engaging though we’re sure it was — is now over as the Brits did not advance to the medal round. While on the subject of Dellavedova, his college coach at St. Mary’s, Randy Bennett, was voted by his peers as the second most underrated head coach in college basketball. The most underrated was Temple’s Fran Dunphy, who garnered a commanding 14% of the votes (Bennett got 9%). A couple surprises on the list were two of the most prominent names in college basketball — Kentucky’s John Calipari (7%) and West Virginia’s Bob Huggins (5%). With tomorrow’s release of the most overrated coaches in the game, is it possible that one or both of those two will also show up on that list? Check in tomorrow at CBSSports.com to find out. Finally today, it is clear that Oklahoma State center Phillip Jurick has little to no interest in playing college basketball again. Just two months after an incident where he was cited for driving on a suspended license, the 6’10” player who was already dealing with recovery from an Achilles tendon tear was arrested over the weekend for possession of marijuana and drug paraphernalia. Predictably, he was suspended by head coach Travis Ford and will not accompany his team on a 10-day exhibition tour to Spain, which begins today. A transfer from Chattanooga State who averaged 17 MPG in 26 games prior to the injury, he’s certainly piling on the hurdles that he must overcome to ever see another day in an OSU uniform again. The NCAA on Tuesday hammered Central Florida with a one-year postseason ban as a result of the dreaded “lack of institutional control” violation in both its football and men’s basketball programs. The penalty is effective next season, which means that UCF’s last round in Conference USA before moving to the Big East will not contain the possibility of a league championship. For all the nitty-gritty details of the findings and what the probation means to the program, individual players and coaches, read Jeff Goodman’s piece on the matter, but the nutshell is that the athletic department allowed at least one agent to run roughshod through the program even though only one of the players involved (AJ Rompza) ever suited up at UCF. Comically, and as the Orlando Sentinel‘s Mike Bianchi writes: “The most tragically comical part of the whole ordeal is this: The Knights were cheating to get recruits, but none of those recruits ended up playing for the school. It’s one thing to be a cheater; it’s another to be an incompetent cheater.” We’re sure that this makes Ohio State, USC, and all the rest feel much better. This has been quite a transitional week for a number of college basketball media personalities, as CBS Sports, ESPN, and Sports Illustrated all announced the signing of new talent on Tuesday. The biggest mover was perhaps ESPN’s Doug Gottlieb, who signed on with CBS to serve as a college hoops studio and game analyst, host his own drive-time radio show on CBS Sports Radio and a television show on CBS Sports Network, and provide exclusive online content for CBSSports.com. Gottlieb is one of our favorites in the business because his devotion to research is impeccable and, even when we disagree with his points (which is uncommon), he cuts through all the typical pandering you see on television to make them. This announcement came on the heels of ESPN’s Monday announcement of its own new hires, with former head coaches Bruce Pearl and Seth Greenberg joining the college basketball studio as analysts, and NBA analyst Jalen Rose slotted to replace the departed Hubert Davis on College Gameday. We don’t have much of an opinion on the coaches at this point, but generally feel like Rose’s transformation from Fab Five knucklehead to a solid NBA analyst is one of the greatest we’ve ever witnessed. Others are less impressed with these hires. Finally, SI announced internally on Monday night that the New York Times‘ rabble-rouser Pete Thamel is moving over to its writing lineup. For those wondering, your RTC editors have not yet been contacted by the Times for Thamel’s open position, but we expect the call at any moment. UNLV basketball has bounced in and out of the Top 25 the last few seasons under Lon Kruger and Dave Rice, but a jump into the national consciousness like the Runnin’ Rebels enjoyed two decades ago with Larry Johnson, Stacey Augmon, Tark the Shark and the rest has remained elusive. But, as Jeff Goodman writes about Rice’s 2012-13 Rebs, the upcoming team will be the most talented that Vegas has seen just off strip since that monstrous team some 20 years ago. With elite talent such as Mike Moser, Anthony Bennett and Khem Birch available to him on the front line, and an athletic backcourt including Anthony Marshall, Bryce Jones and Katin Reinhardt, Rice is realistically talking about pushing tempo to put the “Runnin'” back in the Rebels nickname. If the pieces all come together and UNLV gets past its road woes, this team is a group worth watching all season long. Speaking of Sin City, Seth Davis is working hard this week, with a two-part piece he calls “Summer Springs Eternal” over on SI.com. The article breaks down his July trip to Las Vegas where he no doubt wore a nice white golf shirt and pow-wowed on the bleachers with the top coaches from around the nation. In the first installment published on Monday, he relates anecdotes from Harvard’s Tommy Amaker, Colorado’s Tad Boyle, Pittsburgh’s Jamie Dixon, Illinois’ John Groce, UCLA’s Ben Howland, Memphis’ Josh Pastner, DePaul’s Oliver Purnell, and Butler’s Brad Stevens. Part two published on TuesdayVir includes stories and quotes from Virginia’s Tony Bennett, Gonzaga’s Mark Few, San Diego State’s Steve Fisher, USC’s Kevin O’Neill, Purdue’s Matt Painter, Kansas’ Bill Self, and Georgetown’s John Thompson, III. Even if your team’s coach isn’t on this list, it’s well worth the read to see which guys are willing to drop hints of truth about their players and teams, and those who are completely full of coachspeak. Lists like the one that Athlon Sports just released naming the top 30 coaches in college basketball are a bit of an exercise in futility because the topic is so completely subjective that everyone has a complaint. Still, you don’t release such a list without asking for attention, so here are the top three problems we have with it: 1) It’s very hard to believe that any list of best current college coaches would have anyone other than Duke’s Mike Krzyzewski at the very top. Four national titles, 11 Final Fours, countless wins and accolades… but perhaps most importantly, he saved USA Basketball from the abomination it had become. 2) Roy Williams at #7 is astonishing as well. He has his issues, but is he behind Jim Boeheim and John Calipari? 3) Even if Jim Calhoun retired today, there is no way on this earth that there are 21 better college basketball coaches than him. And definitely not Mike Montgomery, Tom Crean or Mike Brey. Get over there and leave your comments on their list. Last night marked the end of another season of basketball as the NBA crowned its newest champion, the Miami Heat, and we now head into a four-month dry spell without competitive hoops (the Summer Olympics next month will provide a brief respite). While the evening definitely belonged to LeBron James’ coronation as one of the all-time greats, a pair of his role player teammates joined the short list of players to have won both a national title in college as well as a world title in the NBA. With the Heat’s victory, Kansas’ Mario Chalmers (2008) and Duke’s Shane Battier (2001) have now pulled off the twin feat, increasing the the total number of NBA champs with at least one NCAA champion in its regular rotation to an astonishing 71 percent. Battier in particular has long been considered a more valuable player than his numbers might suggest, but it’s no great secret to suggest that winning players tend to find their ways onto winning teams. Congratulations to Battier, Chalmers, James and the rest of the Miami Heat for their 2012 world championship. While on the subject of the NBA, it appears that ESPN analyst Jalen Roseis set to become the Gameday replacement for Hubert Davis next season. We’ve said this before, but the metamorphosis of Rose from Fab Five hothead to a solid ESPN analyst is nothing short of phenomenal. Unlike Davis and most of the Gameday crew, Rose isn’t afraid to mix it up a bit — Digger Phelps taking ridiculous positions for the sake of comedy notwithstanding — and could serve to enliven a group that has a tendency to act non-confrontational. From the same article, TBL suggests that former Virginia Tech head coach Seth Greenberg will become a college basketball analyst on the WWL next season as well, with an eye toward replacing Phelps when he finally decides to retire. We expect to have another post on this topic up later today, but Matt Norlander at CBSSports.com writes that the APR rule which will keep 10 programs out of the postseason in 2012-13 could have a significant deleterious effect on the future of the game if schools don’t take it seriously. The key point is that as many as 60 schools could have been kept out of next year’s postseason if the APR floor of 930 was already in effect (as it will be in 2015). Some of those schools include names like Oklahoma State, Providence, Oregon, Auburn, Arkansas and LSU, and while none of those carry the cachet of Connecticut, the reality of it suggests that a one- or two-year drop in significant academic performance could in fact knock big-time programs such as UCLA or Michigan State out of the NCAA Tournament in some future year. The NCAA has already shown through its refusal of UConn’s appeal that it has no interest in providing exceptions, so this is something everyone involved with college basketball at the ground level will have to carefully monitor. Louisville announced on Thursday that former rising star forward Rakeem Buckleswill transfer to play for Rick Pitino’s son, Richard, at FIU for his final season. The hard-luck player has suffered a conga line of injuries after a promising freshman year in 2009-10 that ended with him going for 20/9 in an NCAA Tournament loss to California. His sophomore and junior seasons were both cut short by ACL injuries, and he is expected to miss the entire 2012-13 season recovering from his latest ligament tear. Louisville appears to be loaded at his position going into the next two seasons, so we’re sure that Buckles viewed this transfer as an opportunity to head closer to home and find some playing time in a comfortable situation to finish his career. Sports fans worldwide recognize The Michigan ‘Fab Five’ team from 1992 and 1993 as one of the most talented and fascinating teams in college hoops history, but 20 years later, the Ann Arbor university wants no part of the infamy. The Fab Five comprised a starting lineup of all freshmen (before it was in vogue) and became famous in equal parts for its revolutionary style, brashness and incomprehensible talent. Those two, along with four other Wolverines teams in the 90s, were erased from the NCAA history books thanks to admissions of players accepting hundreds of thousands of dollars from recruiting booster Ed Martin. In addition, Michigan received a 10-year penalty from the NCAA requiring disassociation from the guilty players and teams, leading to the removal of the ’92 and ’93 Final Four banners from the Crisler Center. That ban will end in 2013, but the news from over the weekend is that the university doesn’t plan on doing anything about it. Despite an upswell of support, there are currently no plans to re-hang the Final Four banners or recognize anything from the Fab Five era, a decision that’s clearly irked the former players but one that makes a lot of sense from a publicity standpoint. The stance taken by UM upholds the school’s integrity, and it knows that all sports fans will regardless still remember the Fab Five. No vacation of wins, removal of banners, or lack of contact with former players is going to cause college basketball fans to forget about the Fab Five era. Even Wolverine recruits who were not yet born when Chris Webber, Jalen Rose, and company changed the college game in the fall of 1991 are aware of the Fab Five and its legacy. This is something that UM administrators fully understand and can take advantage of when handling the issue of historical recognition. Continuing to withhold association with the Fab Five teams on campus in Ann Arbor sends a strong message, and yet it will never erase the great memories from those teams in the eyes of fans worldwide. “What happened was not good, and I don’t think they’ll ever go back up. I don’t,” said Michigan president Mary Sue Coleman in reference to the vacated banners. And why should she feel any differently? After pleading guilty to driving while impaired (marijuana) Derrick Nix was reinstated to the Michigan State team. Nix, who was arrested just after midnight on April 3, had 600 milligrams of marijuana on him at the time of his arrest and admitted to having smoked marijuana two hours before. Nix pleaded guilty to a misdemeanor charge and will be sentenced on May 11. As for his role on the team, Nix has been added back to the roster, but will be monitored closely. Although we have not read anything about an eventual suspension for Nix we assume it is coming with the length to be determined by his actions between now and the start of the season. As we have pointed out multiple times in the past few weeks, just because the April 10 “deadline” has passed that does not mean your team is safe. We could talk about Connecticut losing Andre Drummond, but we won’t because everybody knew he was leaving. Instead we will look to another team in the Big East as Villanova will be without the services of Dominic Cheek, who announced that he would be leaving to play professional basketball. We say professional basketball instead of the NBA because there is no way that Cheek will get drafted in the first round and it seems more likely that he will go undrafted. Cheek says he is pursuing his dream of playing in the NBA, but it seems that if he is going to get there he is going to have to take a detour through Europe or some other version of the minor leagues before getting to the NBA. Despite Cheek’s poor NBA Draft prospects this is a big blow for Villanova, which already was hurt by the departure of Maalik Wayns. The question of what to do with teams the NCAA has erased from the record books can be a difficult issue for many schools. Michigan is the latest school to learn that. The school, which saw an explosion in popularity with the Fab Five that subsequently was scrubbed from the record books, had taken down the Final Four banners from 1992 and 1993 as well as another from a Big Ten title and a NIT championship as a result of an NCAA ruling against the school in relation to inappropriate actions during that period. On Wednesday, University of Michigan President Mary Sue Coleman, the same person who had ordered those banners be taken down, stated that she had no intention of putting those banners up next year when the NCAA’s ruling that the school disassociate itself from those teams and players would be up. Jalen Rose, a member of those Fab Five teams, was less than pleased with the decision and voiced his displeasure on Twitter. We are not sure how or even if Coleman will respond to this, but it is a sticky situation that more and more schools will have to deal with in the coming years. With the top two recruits having announced their destinations for next fall, the major recruiting services are essentially done with their rankings for the class of 2012. Two of the biggest rating services–Rivals and Scout–came out with their final rankings recently. Rivals has come out with their final Top 100 (or Top 150 if you go to their main site) while Scout has released what we think is their final Top 100. With the exception of a few small tweaks the lists are fairly similar as you would expect although we do think that herd behavior has an effect as well. Yesterday, next year’s presumed #1 overall recruit Jabari Parker was named the Gatorade National Boys’ Basketball Player of the Year. The award is notable for the fact that Parker is just the fourth junior to win the award since it was created 27 years ago. The other players who won as juniors: LeBron James, Greg Oden, and Brandon Knight. While this year’s senior class was not that loaded, it did have some high-end talent particularly with the top two guys in the fact. The fact that Parker beat out those guys suggests that we could see a ridiculous recruiting battle over the next 12 months. While we agree with Nocera that college sports would benefit from some fundamental reforms Nocera’s appear rather short-sighted. We were willing to give Branch a pass on the economic aspects of his argument because he is a Civil Rights historian, but Nocera is a business reporter and reportedly consulted with “sports economists, antitrust lawyers and reformers” before coming up with this proposal so the fact that he ignores some basic economic realities is shocking. In addition to blithely estimating how many Division I football and basketball programs would survive with the new requirements, Nocera ignores the thousands of college athletes per year that would be out of scholarships at those schools (guess which socioeconomic class that would disproportionately affect) as well as waving his hands to create a superficial argument that would be politically untenable against Title IX opposition. Perhaps, the most shocking off all is Nocera’s suggestion that all college athletes be provided with lifetime health insurance. You would think a business reporter would realize how unrealistic this would be in the long run (remember the problems the US auto industry had a few years ago with its relatively small population to cover and its much higher revenues? ), but apparently that is too far in the future for Nocera to consider. The Wall Street Journal is one media institution that understands economics even if they do not know the difference between Chrysler and Crisler. In addition to their business reporting and rather opinionated op-ed section, they also do publish interesting features piece such as an interview with former Michigan great Jalen Rose where he talks about his charter school in Detroit, his DUI arrest over the summer, and the controversy around his “Uncle Tom” comments. While Rose received quite a bit of criticism for his DUI arrest (and rightly so), we commend him for trying to be productive and contribute to society when he could very easily be living the easy life in a much more desirable location although we do not fault individuals who choose to do so. It will be interesting to see if Rose’s work is able to create significant results in the academic performance and socioeconomic status for his students in the long run. There will be at least one more chapter in the ongoing Todd O’Brien story as the former Saint Joseph’s player, who had his initial request for a graduate school transfer denied by either Saint Joesph’s or the NCAA, has resubmitted his request to be granted a waiver to play for UAB this season. In his request, O’Brien cites his 3.0 GPA in the fall semester as evidence that his transfer was academically motivated to counter the supposed reason that Saint Joseph’s has used to block his transfer. From what we have read about the NCAA’s interpretation of the rules in this case, it seems like it is unlikely that it will work unless the NCAA decides to overrule its earlier decision where they said they were strongly influenced by the recommendation from Saint Joseph’s. We tried to speak with Phil Martelli about this topic after their loss at Harvard on Saturday, but were told that nobody at the school could discuss the issue until O’Brien waived his student privacy rights. We are not sure how legitimate the school’s reported claim of silence is, but we would love to see what happens if O’Brien calls their bluff on it. Joe Jackson has decided not to transfer from Memphis after considering his options over the weekend. Jackson, who is averaging 11.8 points per game this season had only scored two points combined (both on free throws) in his last two games before missing Saturday’s game for “personal reasons”. After meeting with Josh Pastner the sophomore guard was told to take a few days to think about his future before deciding to come back. We are not sure how Pastner will use Jackson in his first game back, which is against Tennessee on Wednesday. The events of this weekend could either be the beginning of the end of Jackson’s time at Memphis or help him refocus his game and become a more consistent player for a Tiger team that needs someone other than Will Barton to play consistently (and Barton isn’t even that consistent). We have a little bit of ACL news to catch up on from Friday as Minnesota forward Trevor Mbakwe had surgery to repair his torn right ACL and Dayton forward Josh Benson tore his left ACL. Mbakwe’s surgery appears to have went “very well”, but we doubt that we will hear a legitimate time table for Mbakwe’s return to the court for at least another month or two. According to reports, Mbakwe still has not decided if he will apply for a medical hardship redshirt exception or if he will attempt to jump to the NBA after rehab. There has not been any decision on when Benson, who was having a breakout season with 10.9 points and 5.2 rebounds per game, will have surgery, but he will be out for the season. Assuming his recovery goes as expected, we expect to see Benson back in a Dayton uniform at the start of next season. 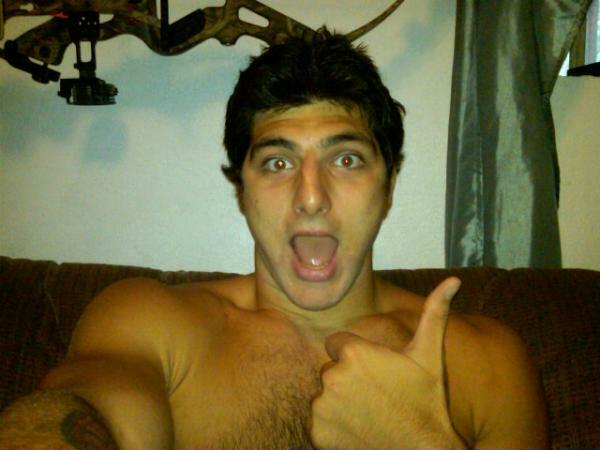 On July 23, Preston Anderson, a former BYU student and current basketball player for Hartnell College in Salinas, California, jumped on his motorcycle at five o’clock in the morning and drove away from his apartment, his roommates assuming he was headed off to a morning workout. Until three days ago, Anderson’s whereabouts have remained a total mystery. He left his cell phone behind and has contacted none of his family or friends. A credit card transaction at a hotel in Corozal, Belize from August 4 — about which his family learned on Tuesday — is the only way any of them know he’s still alive. Hotel staff confirmed that the guest/cardholder was a 6’9” American, same as Anderson. Preston’s father Corey assumes his son is en route to South America, given the current travel vector. We don’t cover a lot of community college basketball around here, but this has sort of a Chris McCandless vibe about it, only more tropical. We hope it ends better, with more of a Ewan McGregor/Charley Boorman-esque resolution. Can you believe that Facebook and Twitter now comprise 50% of recruiting interactions between recruiters and prospects? It is without question the best way for coaches to make contact with players nowadays, especially since the latter group seems reluctant to even pick up or open a ringing cell phone. Before you write that off to an alleged aloofness among high school recruits, first consider (as Pete Thamel of the New York Times did in his article from Tuesday) the case of Nerlens Noel, a top prospect who attends a prep school in New Hampshire. He has one hour of free time a day. You think he’s going to spend it all on his phone talking to coaches giving him their sales pitches? He says of Facebook: “It’s a great way to contact me.” He’s not alone. 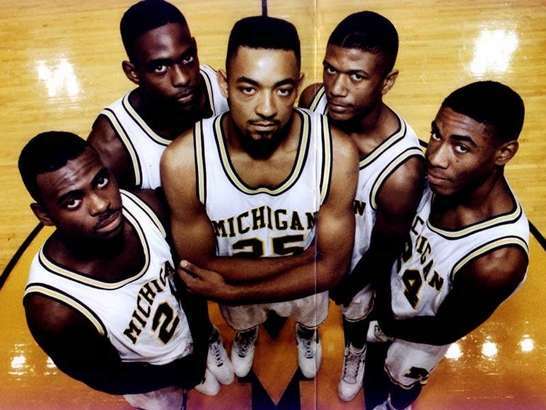 We hope that Chris Webber, Ray Jackson, and Juwan Howard are somewhere laying low and playing it cool right now, since the fates are evidently cracking down on the once-Fab Five. And by the fates, we mean the cops. Jalen Rose is halfway through a 20-day stretch in the pokey after pleading guilty to DUI, and now Jimmy King has been arrested and housed in the same facility (actually, we assume he’s out on bail by now) for failure to pay over $17,000 in child support. As if that wasn’t bad enough, King was arrested on his 38th birthday at a church after authorities saw his name on a basketball camp the church was holding. Whew. SI.com’s Luke Winn is back with another crop of sophomores likely up for big seasons as predicted by his Breakout Sophomore Formula. In addition to his usual clever and well-evidenced insights, two things in particular that we like about this offering from Winn are 1) the formula is designed to avoid insulting your intelligence by making obvious picks like, say, Jared Sullinger or Jeremy Lamb, and 2) Winn takes the time to examine how last year’s prognostications did. In doing so here, he also got in one of the great phrases we’ve seen in any sports article in some time: “libidinous malcontents.” You should already want to do so, but if that doesn’t make you want to click on the above link and check the article out for yourself, nothing will. For most of the past two weeks we have seen Seth Davis manning a CBS/TNT/TBS/TruTV NCAA Tournament desk, but in between covering games for the four networks he has also had some time to write his regular “Hoops Thoughts” column. In this week’s column he delves into two rather controversial topics–further expansion of the NCAA Tournament and whether VCU deserved an at-large bid. There are plenty of other good things in there, but we assume that these two topics will generate the most debate. Jalen Rose has been in the news quite a bit over the past month as the result of the “Fab 5” documentary he helped produce and the comments he made about how he felt about the Duke team that they lost to their freshman year. The first prominent Blue Devil to respond was Grant Hill in a New York Times op-ed piece and now Mike Krzyzewski has chimed in calling the remarks insulting to all African-American students while taking a shot at the Fab 5’s “legacy”. We are sure that Rose is probably ignoring these comments now, but what he cannot ignore is the DUI charges against him stemming from an incident on March 11th (the day before the documentary was released). We are surprised that this didn’t come out earlier and that Rose didn’t tone down his rhetoric after this happened as it was bound to become public at some point. Jordan Williams has decided to test the NBA waters by entering his name, but not signing with an agent. The Maryland sophomore does not appear to be a lock to even be drafted so we expect that he will be back with Gary Williams next season joining an intriguing incoming freshman class that should help put the Terrapins back in the NCAA Tournament. Of course, this isn’t a certainty as we have seen college players make worse decisions. While most of the rumors about coaching moves have been false alarms (including the idiotic Bob Knight-to-Purdue rumor started by Jason Whitlock) one that has been gaining quite a bit of momentum is current Boilermaker coach Matt Painter heading to Missouri. The two sides reportedly met yesterday in Orlando where Painter was on vacation and Painter will reportedly announce his decision by noon today. Based on the figures that have been reported Painter would get a slight pay raise (the $1.3 M to $2 M per year that has been reported ignores the fact that Painter got $1.9 M this year after factoring in performance-based incentives) so we are not exactly sure what would compel Painter to leave Purdue in the fertile recruiting territory of Indiana for Missouri, which is quite frankly a decent sized step down in terms of basketball prestige. Unless the difference in salary is more significant than has been indicated we don’t see a great reason for Painter to leave Missouri. Finally, we prefer not to link to “pay” articles, but sometimes we feel compelled to do so. In this case, John Gasaway of Basketball Prospectus takes a look at Butler and attempts to answer the question of whether they are good or just lucky as they are on the verge of returning to the national championship game for a second consecutive year.